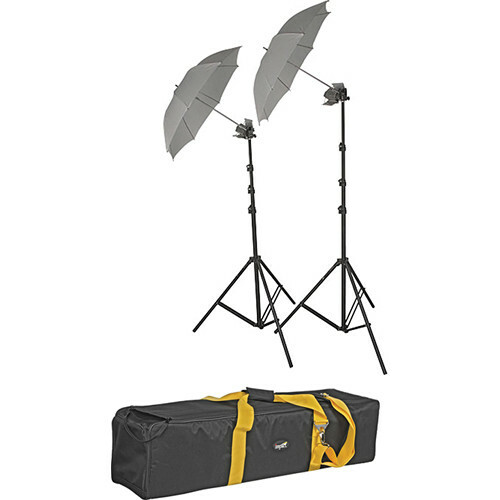 This is a Lowel Tota-light Two-Light Kit by B&H with umbrellas, light stands and a carry case. Compact, rugged and versatile, the broad-throw Tota-light can be used with its umbrella or gel frame and diffusion as a soft key light, fill light, or backlight. With its adjustable reflectors, it can be a smooth and even background light, or point it at the ceiling to raise the ambient (base) light level of a room. Tota-lights are also widely used for photographic copy work. When fitted with an optional EMD 750W bulb, each Tota-light will emit a beam of 41 footcandles with the barndoors at normal position and 34 footcandles with the barndoors at 180° position, from a distance of 10 ft (3 m). Add bulbs of your choice of 300W, 500W or 750W. Bulbs for 220-240 volts, and plug adapters are also available. It all fits in the sturdy soft carry case with a shoulder strap and 35 lb load capacity.